Iron. I’ve been interesting in including an article all about iron and hypothyroidism for some time, but I didn’t want just any article. I wanted the perfect one. The metabolism of thyroid hormones and iron are inter-dependent. 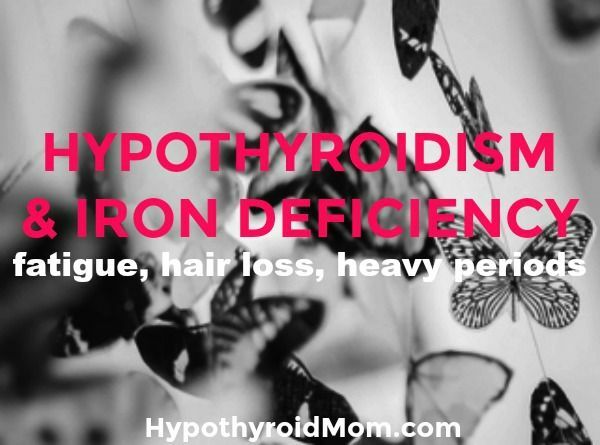 Iron deficiency can produce hypothyroidism and vice versa. This is so important, yet often missed, in the treatment of hypothyroidism. Why isn’t every single person, and I mean EVERY single person, with hypothyroidism given iron testing? The treatment of hypothyroidism by conventional medicine, and all it misses, really baffles me. Hypothyroidism and iron deficiency have more in common than you might think. From fatigue to hair loss, these two conditions can not only make you feel miserable. They are also intimately tied when it comes to your health. Here’s what you need to know about hypothyroidism and how to raise iron levels. Hypothyroidism is a condition in which you either don’t make enough thyroid hormone, you don’t convert it into its active form (T3) or you are not using it at the cellular level. That’s right, it’s not just about how well the thyroid itself functions. Symptoms of hypothyroidism includes fatigue, hair loss, cold intolerance, dry skin, depression, anxiety, constipation, and joint pain—to name a few. Similarly, women who are suffering from iron deficiency experience fatigue, can feel chilled, and experience hair loss. They may also experience restless leg syndrome, anxiety, and irregular heart beats. In America, the majority of cases of hypothyroidism are due to an autoimmune condition known as Hashimoto’s thyroiditis. It’s quite common in women and risk for developing the condition increases with age. When there is adequate T3 available to the cells in the stomach they produce hydrochloric acid (HCl), which helps in breaking down food and liberating nutrients for absorption. Without adequate stomach acid your body is unable to access the iron stores in the food you eat. Your gut and thyroid are intimately connected! Unless your doctor is monitoring your Free T3, odds are you are among the many women without adequate T3, stomach acid or iron. Add that on top of the average 10-15 mg iron that may be lost during menses and you can find yourself iron deficient pretty quickly. What’s worse is iron deficiency anemia makes periods heavier! That’s why checking iron status is at the top of the list in women who have heavy periods, fatigue, hypothyroidism, or hair loss. I recommend 2 baseline tests: CBC and Ferritin. CBC is an abbreviation for a complete blood count. It tells us what your white blood cells and red blood cells look like. A red blood cell that is small or a low hemoglobin or hematocrit are signs of iron deficiency. Ferritin is the storage form of iron. I like to think of it as the savings account. Your red blood cells are the checking account and they are out spending iron. In women, we want to see that number above 50, but closer to the 70-90 range is ideal. Getting your levels tested will help you understand your risk and if supplementation is necessary. Ask your doctor for a CBC and ferritin. Your entire supply of red blood cells is completely replaced in about 4 months. This means that if you haven’t had these labs checked in the last 4 months and you are experiencing symptoms, it is time to see what your blood cells can tell you. A complete thyroid panel, including TSH, free T4, free T3, anti-TPO, anti-Thyroglobulin, and Reverse T3, are necessary to understand your thyroid health. There is definitely some testing to be done in this category. If you have hypothyroidism then I definitely recommend reading up on SIBO (Small Intestinal Bacterial Overgrowth) and talking to your doc about testing. The majority of hypothyroid women in my clinic are positive for SIBO when we test. As I mentioned above, you must have adequate T3 hormone to have a healthy functioning gut. Thorough testing of both your thyroid and your gut are needed to put your symptoms into remission. In the meantime, start by chewing your food really well. Like 30+ chews before you swallow kind of well. I know it sounds extreme, but this level of chewing will not only get your gut primed to do its job, it’ll also break down more of your food so your gut doesn’t have to work so hard. For many women, the addition of hydrochloric acid supplements and digestive enzymes will improve iron absorption and support overall better digestive health. Note: If you’re taking PPIs or oral contraceptives, you are inhibiting your ability to absorb iron. Sure spinach is full of iron, but you won’t be absorbing much of that if you don’t have adequate stomach acid. The iron found in leafy greens is not as bioavailable (meaning you can’t actually absorb it) as well as what is called heme sources of iron, which includes beef, chicken, pork, bison, venison and other meats. Does this mean you shouldn’t bother trying to get iron from vegetables? Far from it! Vegetables contain so much goodness beyond just iron that there is no way we can skip these in our diet. Instead, try combining your leafy greens with citrus, peppers and other vitamin C containing foods. Vitamin C enhances the absorption of iron so it is great to pair with any iron containing food. Add some acid while you’re at it! Apple cider vinegar, balsamic vinegar and lemon juice can help start the digestive process going when it comes to make those mineral available to your gut for absorption. In my clinical experience, I haven’t seen anything raise iron stores quite like liver. Eating grass fed, organic liver, beef heart and bone marrow are mega iron boosting foods. I like mixing ground beef heart with ground beef for some nutrient dense burgers. In women who have heavy periods and are iron deficient we get them going on both an iron rich diet and supplementation due to the increased risk for anemia. Iron sulfate at 325 mg daily is the most common prescription for women with iron deficiency anemia. Not all iron is equal and that iron sulfate your conventional practitioner recommended is not only highly absorbable (read – you poop most of it out), but it is terribly hard on your digestive tract—like not pooping for a few days kind of hard. Instead, I recommend women take a form of iron called bisglycinate. This form is non-constipating, which is good news since that can be a key issue with hypothyroidism. It is also highly absorbable and won’t make you feel nauseous when you take it. This is also why it is commonly recommended for pregnant and breastfeeding women. In patients who are struggling to increase their iron levels, I often recommend 1 capsule daily of iron bisglycinate along with a vitamin C supplement to enhance absorption. Wait at least three to four hours after taking your thyroid hormone replacement medication before taking your iron supplement. Iron can interfere with the absorption of thyroid medication if taken too close together in time. Although iron deficiency can be quite common in women with hypothyroidism, it is treatable and reversible! Dr. Jolene Brighten is a licensed Functional Medicine Naturopathic Doctor, best selling author of the book Healing Your Body Naturally After Childbirth, speaker, and mother with a practice in Portland, Oregon. Dr. Brighten specializes in women’s health, from fertility to postpartum care, adrenal and thyroid support, autoimmune conditions, and digestive disorders. In her patient centered practice, Dr. Brighten thrives on navigating the space between conventional and alternative medicine, all while working with patients to help them achieve optimum balance, health, and happiness. READ NEXT: Could You Be Deficient in Vitamin B12? What about when you’re a vegan? I have a slightly different problem. Hypothyroid and on T3 and T4. Iron levels fine. Iron saturation low. Ferritin high. Feel anemic because of the iron sat, but docs want me off the iron supplements because of the high ferritin. Also have multiple other autoimmune diseases (like fibromyalgia) that I understand can cause high ferritin. Any thoughts? PLEASE HELP! I’m sure receive tons of messages daily so I’ll spare you the back story and get to the point. My Ferritin levels are 15 and I read your suggestion for Ferrochel Iron Chelate along with Vitamin C Buffer. Can these be taken together since the buffer has calcium and magnesium too? Please let me know. Bless you for your work. I was diagnosed with Hypothyroid when I was 19 and the doctor left a small piece in to regulate me. I have been fine up until 1 year ago. My docotor put me on Levothyroxine 50mg. because my Thyroid stopped working. I am a 71 years old women. And, this past 3 months I started to notice hair loss. Of course I went to the doctors. Her rain tests and said everything was fine. Sent me to a dermatologist who took a sample from my head to have it diagnosed. I have to wait two weeks for results. She thinks I will need cortisone shots in my head for the rest of my life to save what hair is left. I want to know if you know if the Adrenal Glands could be the cause?? I have been doing research and I think there is a connection or it’s the Levothyroxine. I am planning on calling my doctor tomorrow and requesting additional testing. I can’t believe that it took 71 years for me to have receding hair line which involves the sides of my head and the top is getting thinner everyday. I am so healthy it’s crazy. I have a very good diet. I am in excellent health other than the thyroid. If you could give me any advise I would really appreciate your help. I am really wanting to go off the Medicine. Thank you for any help. Have family history of autoimmune disorders in family-Sjogren’s to psoriasis and back. I had gastric bypass two years ago, lost a whole 45 lbs. Have all symptoms described here. I currently take 325 ferrous sulfate three times a day. Five sisters, twelve granddaughters. Eight are diagnosed with dysautonomia, rest have one or more autoimmune diseases. How do I get my doctor to take me seriously and order tests necessary to diagnose hypothyroidism? Any info would be greatly appreciated. At 50 I have been vegan for two years and I am serious about taking back my health. My rock bottom ferritin has been a real problem. I’ve fixed reverse T3, added vitamin C and ferrous biglycinate, added undefatted desiccated liver pills, all of that and have barely gotten from a ferritin of 11 to 25. My doctor seems to think it’s my gut causing absorption issues as I also have fairly low T4 despite being on 2 grains of NDT (plus cytomel), so now I’m gathering info and planning to do a couple of months of gut healing diet to see if I can get somewhere. On to reading that linked SIBO article! Please advise me. I would appreciate it.